Major is a common Unggoy rank in the Covenant military. Unggoy Majors are higher in rank than Minors and are slightly more powerful than their lesser counterparts in terms of strength, intelligence, leadership, and morale. They often lead Unggoy Minors in battle, and sometimes entire lances when no higher caste species are present. However, even these higher-ranked Unggoy hold no power over any other forces in Covenant society, save for, occasionally, Yanme'e Minors. Unggoy Majors mostly appear leading a squad of Unggoy Minors under the leadership of any Sangheili, even a Minor. They usually appear wherever Unggoy Minors do. They are found in almost all the levels in the Halo games where Covenant forces are encountered. In Halo 3, not much changes for Unggoy Majors, as they are still led by the lowest ranks of the highest Covenant society, which at this time are the Jiralhanae. They are usually led by Jiralhanae Minors to Jiralhanae Captain Ultras. They also fight alongside Yanme'e, Kig-Yar and even Mgalekgolo on occasion. In Halo: Reach, Majors' methane tanks are distinctly shaped like dual columns. 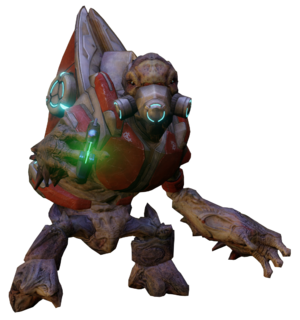 They are seen in combat as decorated in lucid red-colored armor (similar to their Sangheili counterparts), contrary to the orange armor of Unggoy Minors. They are more courageous as well, often staying to fight under conditions that would make their lesser brethren flee. If all of their commanders, Sangheili or Jiralhanae, are killed, they will sometimes continue to fight. However, they still aren't very courageous and can more often be observed fleeing along with Unggoy Minors, though they are more likely to go kamikaze than the Minors. They usually fight alongside a combined team of other Unggoy and Kig-Yar, and have command over the former. Unggoy Majors are the first enemy to wield the hand-held fuel rod gun in the Halo series. They were first seen utilizing these deadly weapons after the player had destroyed the first Pulse Generator in the Halo: Combat Evolved level, Two Betrayals. They also know to use equipment on occasion. After the Human-Covenant War, this rank continued to be used in Merg Vol's Covenant. Despite donning a white combat harness similar to that of Unggoy Ultras, as opposed to the traditional red harness, they were used for the same purposes. Unggoy of this rank fought on behalf of the group during the Battle of Draetheus V in 2554. During combat, Majors are usually the first ones to jump out of the Phantoms. They are known to combine their forces in battle often. The Majors will also pair up and fight together with numerous subordinate Unggoy and even Kig-Yar or Yanme'e soldiers. Unggoy Majors are only slightly stronger than their lesser brothers, and are easily taken down with a headshot. In Halo: Combat Evolved, Majors could be taken out with a single headshot or a couple of body shots. In Halo 3, they are stronger and may require two body shots on Heroic and Legendary. Sometimes Unggoy Minors will still fight even if the Sangheili or Jiralhanae leading them is dead, if an Unggoy Major is nearby, though this is very uncommon. The Majors will sometimes be seen leading a small pack of Unggoy Minors by themselves, but this is rare as well. The presence of Unggoy Majors seems to improve the Minors' accuracy slightly in Halo 3 (possibly because of the stern and almost fierce new influence the Jiralhanae have over the Unggoy). Unggoy Majors also throw plasma grenades more often than Minors. An Unggoy Major in Halo: Combat Evolved. Detailed view of an Unggoy Major in Halo: Combat Evolved. An Unggoy Major in Halo 2. An Unggoy Major on High Charity. An Unggoy Major stands ready in the jungles near Mount Kilimanjaro in Halo 3. An Unggoy Major in the A2 Hydroelectric Facility. A group of Unggoy including four Majors prepare to deploy from a Phantom's troop bay. A group of Unggoy Minors lead by a Major. A render of an Unggoy Major in Halo 3. An Unggoy Major in Halo: Reach. Unggoy Majors along with other Covenant troops in Halo: Reach. An Unggoy Major in Halo: Reach wielding a Type-33 needler. A large group of Unggoy, including Majors, in Halo: Reach. An Unggoy Major in an early build of Halo: Combat Evolved Anniversary. An Unggoy Major in Halo Combat Evolved Anniversary. An Unggoy Major walking on both its arms and legs on Installation 04. An Unggoy Major wearing Ultra-class armor in Halo: Spartan Assault. John-117 encountering an Unggoy Major on Installation 05 in Halo 2: Anniversary.